The Ohio Nature Blog: Help! I've got a Thrush. Although I haven't been widely advertising this, 2010 is the first year that I'm keeping a list of the birds that I see. 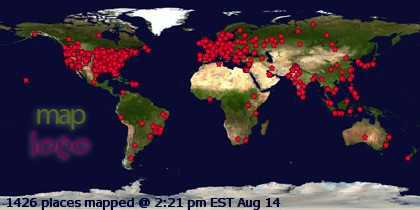 Right now I sit at 100 species, and that includes a trip to Puerto Rico. The new cool thing to do here in Ohio is to see how quickly it takes to rack up 100 birds beginning in January, and some people get that a few weeks into the new year. This is bird #101 for my 2010 list. It's a thrush, but which one? I photographed this in a Amur honeysuckle bush in Kenney Park last Saturday in Columbus. My best guess? 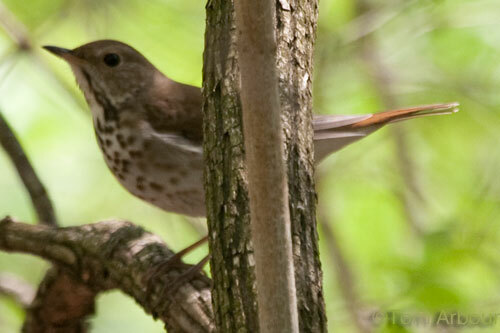 A hermit thrush, judging by the reddish tail, but this bird just doesn't seem to have much of an eye ring. Help! 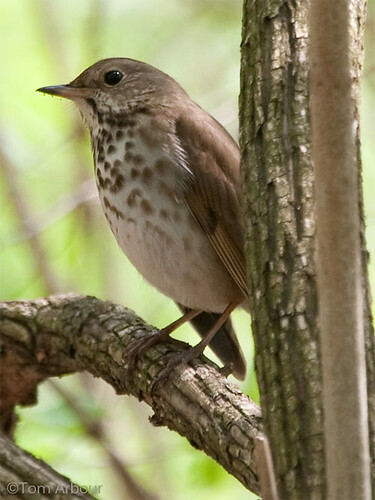 You're totally correct: it's a Hermit Thrush. The eye-ring is a bit thin, but I'd chalk that up to lighting and natural variation. All the other field marks (e.g. the upperpart and tail coloration, face color, spotting on the upper breast and flanks, etc.) all look good for Hermit Thrush. Looks like a Hermit to me as well. Great shot. I just recently found this bird as a lifer myself, and now have seen a bunch, funny how that works. Yep, Hermit Thrush. Nice of it to pose for a photo - around here they usually live up to their name, and my photos are consequently poor! Thanks guys. I just happened to catch this bird in a great moment. It was hiding in some invasive bush honeysuckle, and I just happened to be in the midst of that habitat.